And the racing world is following suit. Obviously, the highest profile NASCAR Nextel Cup drivers are leading the way in the racing world to raise money. Lowe's donated $480 for every lap Jimmie Johnson completed in Sunday's race at California Speedway. Tony Stewart donated his winnings from the race to the American Red Cross, and his Joe Gibbs Racing team matched that amount. Penske Racing South's three teams will gather donations at its teams' souvenir haulers over the next two weeks. The company said it would match every dollar donated. 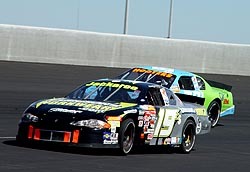 But it isn’t only the Nextel Cup stars who are stepping up. All around the country, the nation’s short trackers are stepping up to show their support for those affected by the Hurricane and it’s aftermath. Everyone from drivers to teams to tracks and even sanctioning bodies are all finding ways to allow their fans to help donate to the relief efforts, mostly through the American Red Cross and Salvation Army. NASCAR, which also sanctions short tracks all over the country and sanctions several major short track series, announced it has aligned its industry with the American Red Cross to support in every way possible charitable efforts in the aftermath of the Hurricane Katrina disaster. "One of the special qualities of the NASCAR industry is helping others in times of need," NASCAR Chairman and CEO Brian France said. "NASCAR is working to rally our drivers, teams, tracks, partners, and most importantly, our fans to this common cause. 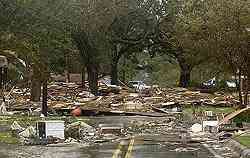 Everyone has seen the damage from the Hurricane, now it is time to step up and help. By now, we all know what’s happened along the Gulf Coast states of the Southeastern United States. We’ve all seen the photos, read the stories and watched the news of the devastation that fell upon Louisiana, Mississippi and Alabama following Hurricane Katrina. In light of everything that has happened, we all also know how much help is needed for those displaced by this horrific storm. Food, clothing, supplies and most importantly, money, are all needed commodities. Because of this, a lot of high profile people are stepping up. Movie stars, singers, celebrities and professional athletes are leading the American charge to help raise funds for those affected by the Hurricane. "This tragedy has impacted millions of Americans, many of whom are NASCAR fans themselves, and we have reached out to the American Red Cross to do everything we can to provide relief. Like all Americans, our hearts ache as we realize the devastating impact this storm has had. We know NASCAR fans are eager to help. Our alliance with the American Red Cross gives those fans, and our entire industry, an opportunity to band together in this common cause." NASCAR has established a designated Web page to coordinate NASCAR fan support of the relief efforts. NASCAR is using its power as a sanctioning body to do good in the relief efforts. Outside of the NASCAR name though, lots of people are stepping up, and showing the power and compassion of the Short Track world. The USAR Hooters Pro Cup Series is no exception. 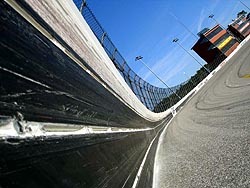 The popular Short Track Series is still finalizing plans for their Hurricane Katrina Relief Effort, but it will take place at Myrtle Beach Speedway during the “Four Champions Championship Series” event at the track. At this past weekend’s ASA Late Model Series race, Track Side Charities (a long time supporter of ASA LM driver Chad Wood) and 94.1 KRNA, Eastern Iowa's Real Rock hosted a racetrack party for ASALM Series teams and fans. Following the Hurricane, Trackside Charities announced that the proceeds from the event will be diverted to help the folks down south. The NASCAR Busch North Series can be proud to have teams like Grizco Racing associated with the series. The team, which field cars for Andy Santerre, Mike Stefanik and Brad Leighton, opened their doors to the public and serve as an emergency drop off point for donations headed to the Gulf region. Donations of water, non-perishable food items and clothing are being accepted, along with financial contributions, until Thursday, September 8th at 7 pm, when the American Red Cross will pick it up for transport. The shop address is 5254 Pit Road South in Concord, North Carolina, 28027. The team said that anyone with any further questions should not hesitate to call the race shop at 704-455-6665. Pro Cup officials are working on a plan as well. Affected enough by other Hurricanes in the past, Jeff and Tracy Hamner, decided to step up to and donate. Models around the Southeast, decided to donate to the Red Cross in the name of Hamner Racing Engines and their race team. The relief doesn’t come from just the asphalt world either. Two Dirt Late Model stars, along with their many fans, will be making a contribution to the Hurricane Katrina Relief effort at the 37th Annual WORLD 100 at Eldora Speedway. Chub Frank and Josh Richards will be donating 10% of all their apparel sales during the WORLD 100 weekend to the American Red Cross. Both Frank, known as ‘Chubzilla’ and Richards, known as ‘Kid Rocket’, will have their apparel available at the Slavic Custom Shirts & Decals souvenir trailer located on Eldora’s ‘Souvenir Row’. Additionally, fans will also be able to make donations to the America Red Cross at the Slavic Souvenir Trailer throughout the weekend and beyond. “After seeing the news about what happened down in Louisiana and Mississippi, and thinking back to the outpouring of support I got early last year after we lost our shop in the fire, we thought this might be some small way to give back,” stated Chub Frank. Andy Santerre (#44) and Grizco are working to help out however they can. point of all racing, many have stepped up efforts to allow drivers and fans alike to make a difference. Thompson International Speedway has joined in the relief effort by working with the Connecticut National Guard in an effort to provide race fans with an opportunity to assist in this much needed relief effort. On Sunday, September 11th, a truck will be parked near the main entrance to the speedway to collect donations to be delivered to relief agencies in the hurricane stricken areas. Race fans attending the Thompson Sunoco 300 will be able to make their donations easily and efficiently. The truck will be parked near the main entrance to the Thompson International Speedway between the hours of 9 AM and 3 PM. Once the collection is complete, the truck will go directly to Bradley International Airport to have the supplies air lifted to the besieged cities and towns. Mobile Speedway, which was directly effected by the hurricane’s wrath, suffering substantial damage, is also pitching in during the time of need. Mobile has set up a drop off center to collect money and goods for the Pascagoula and Mississippi Gulf Coast areas. “We know for a fact that there is a big need for just about every thing in Pascagoula and areas west of them,” said Secretary Nancy Schreiner. “We want to do whatever we can to help them. The trailer is parked in front of the MIS ticket office and donations can be delivered from 9 am until 5 pm. South Boston Speedway is showing the strength of their fans as well. The track, along with God's Pit Crew, based in Danville, Va., are teaming together to aid the victims of Hurricane Katrina along the Gulf Coast. "The death and destruction that took place earlier this week in Louisiana, Mississippi and Alabama is almost unbelievable," South Boston Speedway General Manager Cathy Rice said. "Those people in that area are in desperate need of our help and we are certain that race fans, who are known to be giving and compassionate, will aid in this cause." God's Pit Crew will be making several pit stops at South Boston Speedway in the coming weeks to collect donations for the hurricane victims. Donations will be accepted at the speedway office 9 .m. until 5 p.m. Monday through Friday and also on race days slated for Saturday, Sept. 3, and Saturday, Sept. 17. 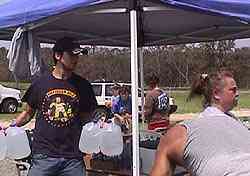 This past weekend at the track, driver’s stepped up and helped collect money as well. For one fan, it was a moving experience. Tracks all over the country took up donations this past week and will continue to in the coming weeks. A couple of Florida tracks, both of which know the devastation of hurricanes, led the way. New Smyrna Speedway collected $670 from their fans last weekend, while Orlando SpeedWorld collected $2,490. How big of an impact does the Hurricane Relief have? Check this out. One of the legendary tracks in all of racing, Darlington Raceway, announced the track is teaming up with a local chapter of the American Red Cross. For a monetary donation, they are going to let fans drive their personal vehicles five laps around the famed “Lady in Black.” Called “Laps for Relief,” the event will take place on Saturday, September 17th from noon to 5pm. It's been almost 30 years since Darlington has allowed people to come drive their cars on the track. Questions can be forwarded to Cathy Elliott, PR Director at 843-395-8823. 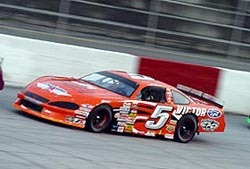 We at Speed51.com encourage all of our fans to donate money or supplies to the relief effort. Find whichever wan you want to help and help. This is a tough time in our nation’s history and we all need to stick together, side-by-side, in these tough times. Drive at Darlington and help out.